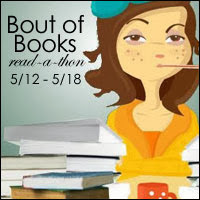 Okay, so the Dewey's 24 Hour Read-a-thon, was great fun (even if I did get slightly distracted), so I've decided to give the Bout of Books Read-a-thon a try! I'm fairly excited for this, especially since I'll be home from college and working on my Summer of Series. So yes, I can't wait to join in the fun! Stay tuned for what I plan on reading!